Startimes, the leading digital TV in Africa has reacted to the recent price hike in subscription by DSTV and thereby planned a reduction in subscription fee for its Classic bouquet. Startimes Nigeria has officially announced the new price for its Classic bouquet from N2,600 to N1,900 to be effective come September 1, 2018. In addition, the bouquet will receive some new channels like Ebony Life TV, ST Nollywood Plus / Fox and ST Kids. Startimes also declared one month free viewing for all its subscribers. 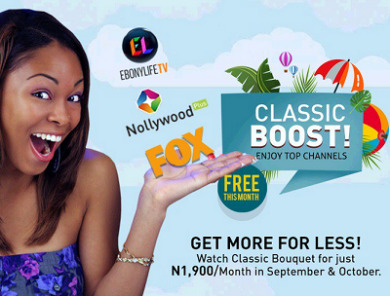 Starting from August 1 - 30, 2018, you will get one month free access to all channels, rrespective of subscription status to ensure customers have access to its new channels, available on the classic bouquet. Startimes took to their Twitter handle to react and announce the new price reduction for its Classic bouquet from N2,600 to N1,900, while adding Ebony Life TV, ST Nollywood Plus & Fox to the list of channels.